Manage your money and take care of all your banking needs from anywhere with BECU Bank online banking. The BECU online banking login gives you the access you need to pay bills, view eStatements, transfer funds, and use the BECU Money Manager to reach your financial goals. The login process is user-friendly and easy to access. This clear and convenient guide will give you all the steps you need to access your account using the login page, the BECU webpage, or your mobile device after you Enroll in Online Banking with BECU. Access the BECU online banking login page. Input the account username in the User ID field. Enter the account password in the Password field. Select the red Login button. Click the red Online Banking button in the upper right corner to access the login page. Input the account login information in the appropriate User ID and Password fields. Access the login page with your mobile device. Download the BECU Mobile application to your device by locating it in the App Store and installing it. Launch the app by choosing Open in the App Store or clicking the red BECU icon. Click the red Get Started button. This screen will only appear the first time you log in to the app or after an update. Input the account username in the Username box. Enter the account password in the Password box. Tap to check the Remember Me checkbox if desired. Click the red Log In button. Download the BECU Mobile application to your device by locating it on Google Play and installing it. Launch the app by choosing Open from Google Play or clicking the red BECU icon. For the BECU online banking login to work properly on your desktop or mobile device, ensure you have the most up to date version of your web browser or mobile application. If you experience issues accessing the login page, check your security settings, allow pop-ups from BECU, and reset your device if needed. For assistance with your User ID or Password, BECU offers online assistance with the Forgot your Password? and Forgot your User ID? links. You can also find the answers to many online banking and other common bank questions on the Top Questions page. For further assistance with accessing the online banking system, reach out to BECU customer service at 1-800-233-2328. 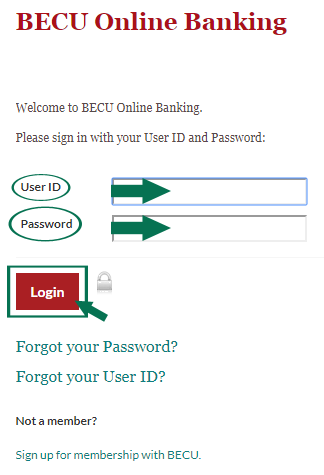 With these instructions, you are ready to begin using BECU online banking services today. The BECU online banking login page is accessible from almost any Internet-connected device. For more information about the BECU online banking services, visit the maine BECU website, www.becu.org. Using your BECU online banking account, you can send BECU customer service online messages. The messages and replies will be stored in your personal account, for safety. You can also contact the BECU Bank member contact center for assistance or questions at 1-800-233-2328. Visit the Contact Us section at www.becu.org for more contact details and options.